Update 2012: Great news: Audible has made available the George Guidall version of Touch. (At the time we did the podcast, there was no authorized digital download of Touch. Copies of the George Guidall audiobook could only be acquired via eBay or other second-hand sellers.) 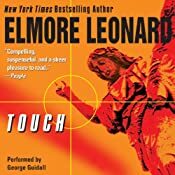 By the way, there is another 1996 audiobook of Touch from Books on Tape, narrated by Alexander Adams aka Grover Gardner. We had a copy of that one but it somehow disappeared from our collection.